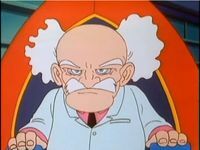 Doctor Albert W. Wily is the main antagonist in the Mega Man series. 1.2.1 "Super Mario: Verloren in der Zeit"
Dr. Wily's appearance in Captain N: The Game Master. Dr. Wily appeared in the TV show Captain N: The Game Master, occasionally alongside Donkey Kong. In this show, he was a technologically knowledgeable servant of Mother Brain. He was voiced in the series by Ian James Corlett. "Super Mario: Verloren in der Zeit"
Dr. Wily and the evil Princess Toadstool detaining Mario in "Super Mario: Verloren in der Zeit". Dr. Wily appears in the Club Nintendo comic, "Super Mario: Verloren in der Zeit". In said comic, he is a mad scientist planning to rule over Mario's city. In order to achieve this goal, he masquerades as a mailman and delivers Mario an Alarm Clock. Thinking that it is donated to him by a fan, Mario tries it out. It turns out, however, that in fact it is a time machine, taking him to various ages, past and future. In the meantime, Dr. Wily manipulates the citizens of the town, amongst others Yoshi and Mario's neighbour Miss Steinbrunnen. Wily even makes Princess Toadstool work for him. He has a fortress with an unknown location which Mario manages to enter. When detected by Toadstool, however, Dr. Wily ties him to a machine, seemingly in order to manipulate him as well. As it turns out, the story was only a nightmare of Mario's. 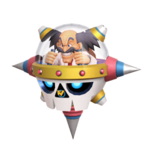 Dr. Wily appears as a trophy in Super Smash Bros. for Nintendo 3DS / Wii U.
Dr. Wily in his Wily Capsule appears as an Assist Trophy in Super Smash Bros. Ultimate. The Wily Capsule is Dr. Wily's personal escape pod, and usually his last-ditch form of attack in his battles against Mega Man. The model seen in Super Smash Bros. Ultimate comes from Mega Man 7. When summoned, Dr. Wily will fire red and blue energy balls from the capsule, which will home in on the nearest fighter. If he is defeated, he will fall to the ground and enter his supplication pose. Both Dr. Wily and the Wily Capsule also appear as spirits. NES Mega Man 2 (07/1989) A mad scientist from the Mega Man series who develops deadly robots to try and take over the world. He's not above stealing the robots made by other scientists and modifying them for his own evil ends, either. Dr. Wily has a tendency to beg for forgiveness when Mega Man inevitably defeats him; those tears don't look all that genuine, honestly... A mad scientist from the Mega Man series who develops deadly robots to help him take over the world. He's also not above taking robots made by other scientists and modifying them for his own evil ends. Dr. Wily has a tendency to beg for forgiveness when Mega Man inevitably defeats him, but somehow he never learns. This page was last edited on March 26, 2019, at 01:50.